NASA’s Dawn spacecraft turned science fiction into science fact by using ion propulsion to explore the two largest bodies in the main asteroid belt, Vesta and Ceres. The mission will end this fall, when the spacecraft runs out of hydrazine, which keeps it oriented and in communication with Earth. This photo of Ceres and the bright regions of Occator Crater was one of the last views NASA's Dawn spacecraft transmitted before it completed its mission. This view, which faces south, was captured on Sept. 1, 2018, at an altitude of 2,340 miles (3,370 kilometers) as the spacecraft was ascending in its elliptical orbit. This photo of Ceres and one of its key landmarks, Ahuna Mons, was one of the last views Dawn transmitted before it completed its mission. This view, which faces south, was captured on Sept. 1, 2018, at an altitude of 2220 miles (3570 kilometers) as the spacecraft was ascending in its elliptical orbit. NASA’s Dawn spacecraft has gone silent, ending a historic mission that studied time capsules from the solar system’s earliest chapter. Dawn missed scheduled communications sessions with NASA's Deep Space Networkon Wednesday, Oct. 31, and Thursday, Nov. 1. After the flight team eliminated other possible causes for the missed communications, mission managers concluded that the spacecraft finally ran out of hydrazine, the fuel that enables the spacecraft to control its pointing. Dawn can no longer keep its antennas trained on Earth to communicate with mission control or turn its solar panels to the Sun to recharge. The Dawn spacecraft launched 11 years ago to visit the two largest objects in the main asteroid belt. Currently, it’s in orbit around the dwarf planet Ceres, where it will remain for decades. Dawn launched in 2007 on a journey that put about 4.3 billion miles (6.9 billion kilometers) on its odometer. Propelled by ion engines, the spacecraft achieved many firsts along the way. In 2011, when Dawn arrived at Vesta, the second largest world in the main asteroid belt, the spacecraft became the first to orbit a body in the region between Mars and Jupiter. 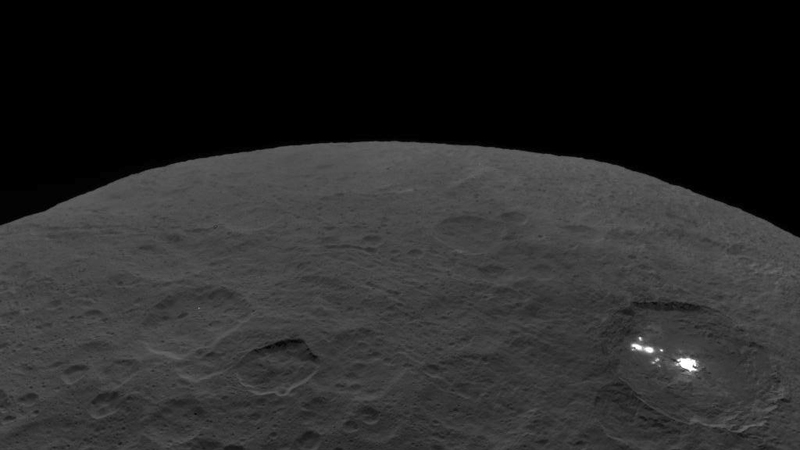 In 2015, when Dawn went into orbit around Ceres, a dwarf planet that is also the largest world in the asteroid belt, the mission became the first to visit a dwarf planet and go into orbit around two destinations beyond Earth. "The fact that my car's license plate frame proclaims, 'My other vehicle is in the main asteroid belt,' shows how much pride I take in Dawn," said Mission Director and Chief Engineer Marc Rayman at NASA's Jet Propulsion Laboratory (JPL). "The demands we put on Dawn were tremendous, but it met the challenge every time. It's hard to say goodbye to this amazing spaceship, but it’s time." The data Dawn beamed back to Earth from its four science experiments enabled scientists to compare two planet-like worlds that evolved very differently. Among its accomplishments, Dawn showed how important location was to the way objects in the early solar system formed and evolved. Dawn also reinforced the idea that dwarf planets could have hosted oceans over a significant part of their history – and potentially still do. Because Ceres has conditions of interest to scientists who study chemistry that leads to the development of life, NASA follows strict planetary protection protocols for the disposal of the Dawn spacecraft. Dawn will remain in orbit for at least 20 years, and engineers have more than 99 percent confidence the orbit will last for at least 50 years. So, while the mission plan doesn't provide the closure of a final, fiery plunge – the way NASA’s Cassini spacecraft ended last year, for example – at least this is certain: Dawn spent every last drop of hydrazine making science observations of Ceres and radioing them back so we could learn more about the solar system we call home. The Dawn mission is managed by JPL for NASA's Science Mission Directorate in Washington. Dawn is a project of the directorate's Discovery Program, managed by NASA's Marshall Space Flight Center in Huntsville, Alabama. JPL is responsible for overall Dawn mission science. Northrop Grumman in Dulles, Virginia, designed and built the spacecraft. The German Aerospace Center, Max Planck Institute for Solar System Research, Italian Space Agency and Italian National Astrophysical Institute are international partners on the mission team. 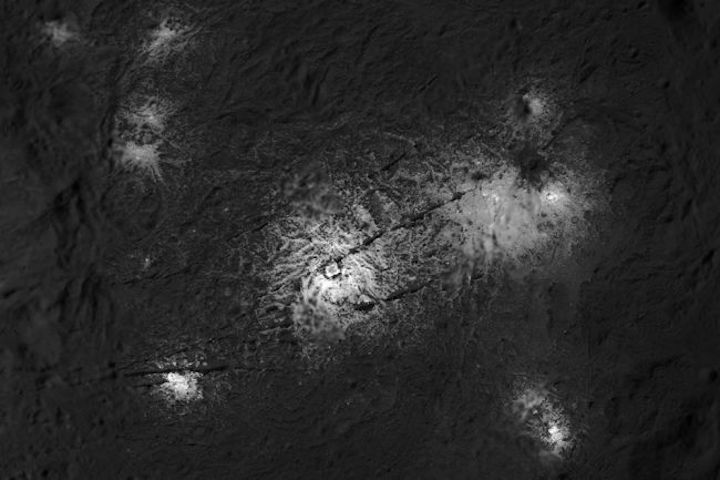 The bright spots of Occator Crater shine from the surface of Ceres. Research led by The University of Texas at Austin is helping reveal how the spots formed from cryomagma. A recent NASA mission to the dwarf planet Ceres found brilliant, white spots of salts on its surface. New research led by The University of Texas at Austin in partnership with NASA's Jet Propulsion Laboratory (JPL) delved into the factors that influenced the volcanic activity that formed the distinctive spots and that could play a key role in mixing the ingredients for life on other worlds. The volcanoes on Ceres are cryovolcanoes, a type of volcano that forms on planetary bodies with icy shells and that moves salty water known as cryomagma from underground reservoirs to the surface. Scientists think that cryovolcanoes on Jupiter's icy moon Europa could help foster chemical mixing that could make complex molecules needed for life. Learning more about how these volcanoes work on Ceres--which is a simpler geological environment than Europa--could help scientists get a handle on the primary forces that drive their activity. "Cryovolcanism looks to be a really important system as we look for life," said lead author Marc Hesse, an associate professor at the UT Jackson School of Geosciences. "So we're trying to understand these ice shells and how they behave." The final version of the research was published online on Feb.8 in the journal Geophysical Research Letters. The research was co-authored by Julie Castillo-Rogez, a planetary scientist at NASA's JPL. At 585 miles across, Ceres is the largest planetary body in the asteroid belt between Mars and Jupiter. 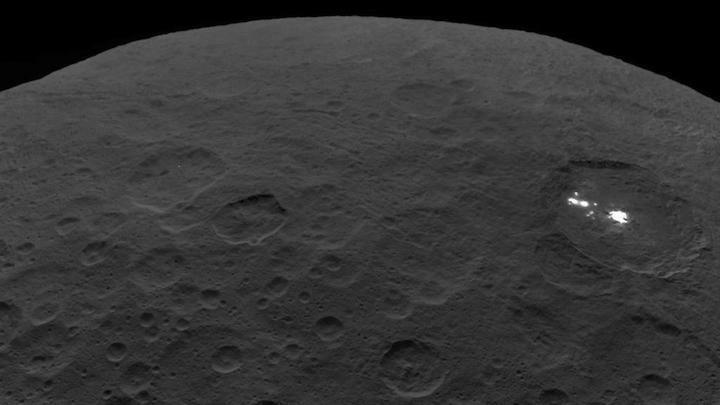 Forged billions of years ago from rock and ice and far enough from the influence of other planets, scientists had thought that Ceres' days of active geology had come to close. But the NASA Dawn mission changed that view when the space probe sent back pictures of bright, white spots at the bottom of impact craters. The spots turned out to be the remnants of cryomagma. The location of the spots at or near the center of crater basins suggests that the heat and energy generated by asteroid impacts could jumpstart geology on Ceres, creating reservoirs of cryomagma that were then brought to the surface by conduits such as fractures. The new research looked specifically at the deposits on the floor of the 90-mile-wide crater Occator, which was formed about 20 million years ago. However, the deposits here are as young as 4 million years old, indicating a relatively recent formation geologically speaking with respect to the crater itself. Earlier research conducted by other scientists found that the conditions on Ceres wouldn't allow for the cryomagma generated by the Occator impact to exist for more than about 400,000 years. The age discrepancy between salt deposits and impact timing raises a question: How could a reservoir of melt stay in a liquid state for millions of years after impact on an otherwise geologically stagnant world? In their new paper, Hesse and Castillo-Rogez were able to significantly extend the life of the cryomagma by including more up-to-date details on Ceres' crustal chemistry and physics. "It's difficult to maintain liquid so close to the surface," said Castillo-Rogez. "But our new model includes materials inside the crust that tend to act as insulators consistent with the results from the Dawn observations." The new calculations indicate that the cryomagma of Occator could last up to 10 million years--a value that doesn't close the time gap completely, but that indicates that the additional data helps make a more realistic cooling timeline. "Now that we're accounting for all these negative feedbacks on cooling--the fact that you release latent heat, the fact that as you warm up the crust it becomes less conductive--you can begin to argue that if the ages are just off by a few million years you might get it," Hesse said. Jennifer Scully, a planetary geologist at NASA's JPL who studies Ceres but was not involved with the study, said that the findings are a great contribution toward unpacking the geologic history of an alien world. "They used more up-to-date data to create their model," said Scully. "This will help in the future to see if all of the material involved in the observed deposits can be explained by the impact, or does this require a connection to a deeper source of material. It's a great step in the right direction of answering that question." 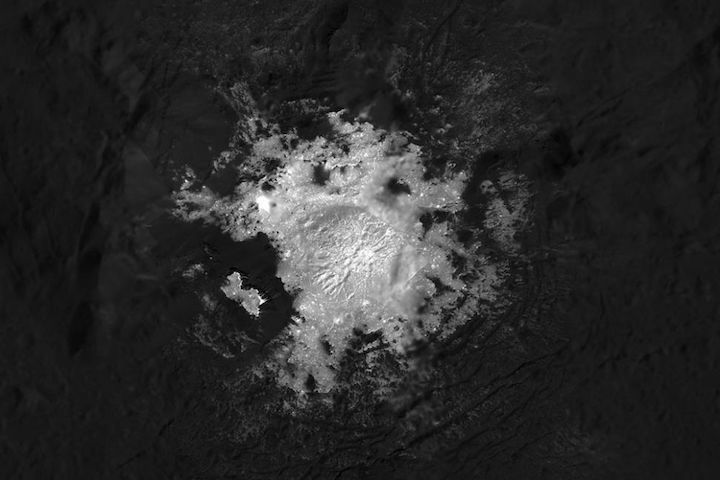 This mosaic of the bright spot known as Cerealia Facula inside the dwarf planet Ceres' Occator Crater is based on images obtained by NASA's Dawn spacecraft during its second extended mission, from an altitude as low as about 21 miles (34 kilometers). 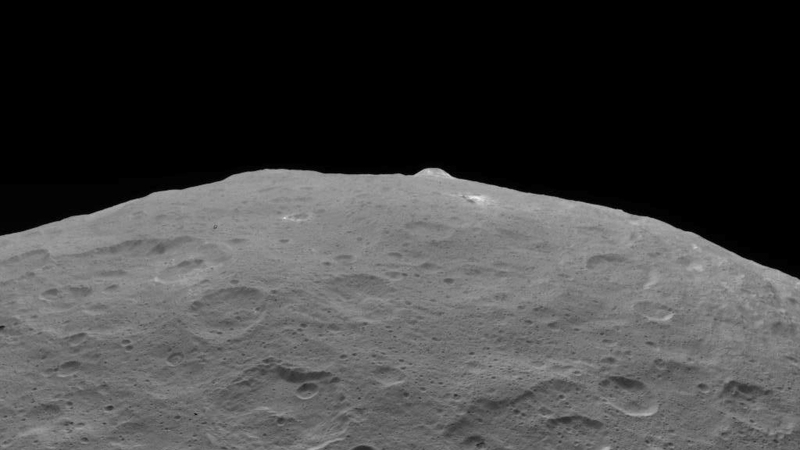 Some parts of the dwarf planet Ceres harbored pockets of near-surface water for millions of years in the recent past, a new study suggests. 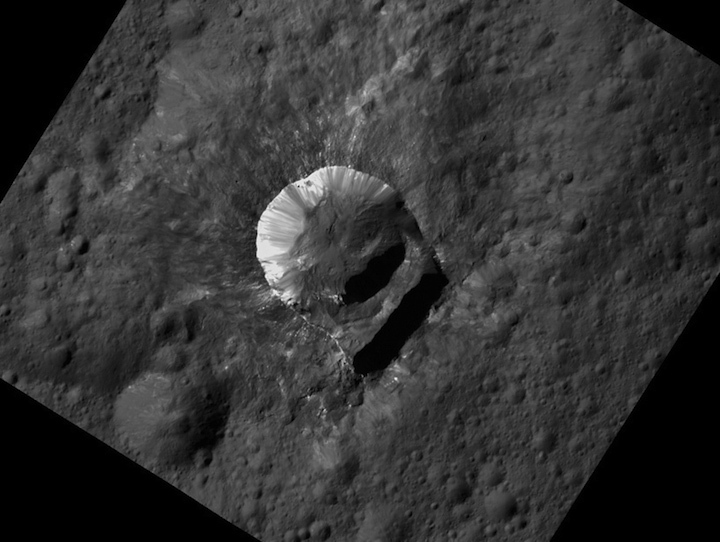 Researchers analyzed observations of Ceres' Occator Crater made by NASA's Dawn spacecraft, which studied the dwarf planet from orbit from March 2015 to October 2018, when the probe ran out of fuel. Such sublimation occurred as recently as 4 million years ago; that's the apparent age of the youngest deposits on Occator's floor. And that 16-million-year gap is puzzling, researchers said. "It’s difficult to maintain liquid so close to the surface," study co-author Julie Castillo-Rogez, a planetary scientist at NASA’s Jet Propulsion Laboratory (JPL) in Pasadena, California, said in a statement. Indeed, previous research has estimated that "cryomagma" could stay liquid in Occator's near subsurface for just 400,000 years or so. But the new study provides at least a partial answer. Modeling work by Castillo-Rogez and study lead author Marc Hesse, an associate professor at the University of Texas' Jackson School of Geosciences, suggest that Occator's near subsurface contains insulating materials, which could have kept the "cryomagma" liquid for about 10 million years. This close-up photo of the Vinalia Faculae in Ceres' Occator Crater was captured by NASA's Dawn spacecraft in its second extended mission, from an altitude as low as 21 miles (34 kilometers). "Now that we're accounting for all these negative feedbacks on cooling — the fact that you release latent heat, the fact that as you warm up the crust it becomes less conductive — you can begin to argue that if the ages are just off by a few million years, you might get it," Hesse said in the same statement. "They used more up-to-date data to create their model,” said JPL planetary geologist Jennifer Scully, who was not involved in the new research. "This will help in the future to see if all of the material involved in the observed deposits can be explained by the impact, or does this require a connection to a deeper source of material. It’s a great step in the right direction of answering that question." The new study was published in December in the journal Geophysical Research Letters. The Dawn spacecraft enjoyed a long and very productive life. Before its work at the 590-mile-wide (950 km) Ceres, Dawn orbited the protoplanet Vesta, which is about 330 miles (530 km) wide. Vesta and Ceres — the two largest objects in the asteroid belt between Mars and Jupiter — are considered leftovers from the solar system's planet-formation days, and Dawn's mission was designed to help shed light on this mysterious, long-ago epoch (hence the name, which is not an acronym). Dawn was the first probe ever to orbit a dwarf planet, and the first to circle two celestial bodies beyond the Earth-moon system.